The perfect gift for any Magnetix addict, this innovative set gets your child's creative juices flowing. 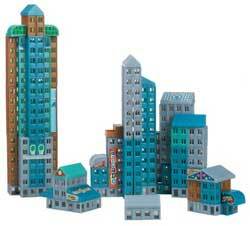 Simply use the three included blueprints or come up with your own crazy combinations to build a MagnaWorld City. Easy to assemble, destroy and reassemble for hours of fun. Measures 4"L x 16"W x 11"H.